Admission criteria for the M.S.in Pharmaceutical Sciences with emphasis in pharmacy administration and the Ph.D. in Pharmaceutical Sciences with emphasis in pharmacy administration are the same. When completing the online graduate application, students should select which program to which they are applying. Applicants must have a B.S. degree in pharmacy, a B.S. degree in pharmaceutical sciences, or higher. (A degree in a discipline related to marketing, management, economics, epidemiology, or other health-related field may also be considered for admission upon demonstration of a commitment to pursuing a career in the field of pharmacy or the pharmaceutical industry.) College transcripts with a minimum of a B average (3.0 on a 4.0 scale) are required. Applicants must take and submit the scores from either the GRE or the GMAT. The University code is 1840. International applicants also must take the TOEFL examination and score at least 600 on the paper-based test; 100 on the internet-based test; or 250 on the computer-based test. The University code is 1840. Two letters of recommendation, an interview, a resume, and a statement of purpose are used to evaluate candidates. You must apply to the M.S. or Ph.D. program online and get additional application information from the University of Mississippi Graduate School website. Applications must be complete by January 15 to guarantee consideration. All applicants meeting the deadline will be considered for admission as well as for a graduate assistantship. However, there are only a limited number of assistantships available. Electives may be courses offered in the PhD program or from other Departments across campus. Students may take electives from various departments (e.g., economics, education, business, psychology, applied sciences) across campus. Please see the Graduate School catalog for a complete listing of courses offered on campus. 541 & 542. PROBLEMS IN PHARMACY ADMINISTRATION. Investigation of individual problems. surrounding the establishment of the problem statement, hypothesis generation and testing, measurement, research design, sampling theory, data collection and analysis, and ethical conduct in research. 679. PRIMARY DATA TECHNIQUES. An overview of the primary research techniques used in executing research projects related to pharmaceutical marketing and/or pharmacy management. Included are sampling, instrument development, and data collection using several personal interview and self-administered survey techniques. Prerequisite requirements for this course may also be satisfied by consent of instructor. Prerequisite: PHAD 577 with grade of C.
674. RESEARCH IN PHARMACY ADMINISTRATION. Investigation of individual problems. 780. GENERAL LINEAR MODELS. An intermediate-level course in regression analysis methods covering the basic theory and application of the general linear model (GLM) to conduct relevant analyses. Simple and multiple linear regression are extensively covered as well as a number of procedures falling under the general category of analysis of variance (ANOVA). Pre-requisite(s): An introductory statistics course at the graduate-level, which covered topics such as: descriptive statistics, applications of basic probability theory, commonly used sampling distributions, hypothesis testing, analysis of two-way contingency tables, one and two sample tests, confidence intervals, correlation and simple linear regression, and introduction to one-way analysis of variance. 781. APPLIED MULTIVARIATE ANALYSIS. An intermediate-level course examining techniques generally considered to be multivariate in nature or having a multivariate approach to analyzing data (e.g., multivariate analysis of variance, repeated-measures analysis of variance, discriminant analysis, logistic regression, cluster analysis, and factor analysis).Pre-requisite(s): Phad 680 (Minimum grade: C) or Consent of the Instructor. 687. SECONDARY DATA TECHNIQUES. Techniques and principles useful in using secondary data to answer research questions, including data and data source evaluation,accessing and preparing secondary databases, and review of common data types and sources. 689. PHARMACEUTICAL AND HEALTHCARE POLICY. The delivery and financing of pharmaceuticals and pharmacy services; development and implications of pharmaceutical and healthcare policies in the public and private sectors at the federal and state levels. 690. DATA MANAGEMENT AND STATISTICAL SOFTWARE. Overview of data management and a survey of statistical software. 792. DRUG DEVELOPMENT AND MARKETING. Provide participants with insight into the administrative procedures involved in the developing and marketing of new pharmaceuticals, from discovery through market approval, including both industrial and policy perspectives. 693. HEALTH ECONOMICS. The financing and delivery of health care in the U.S., including economics of health care, economics of the U.S. health care system, and current policy issues including health care expenditures, health care reform, and economics of the uninsured. 794. PHARMACOECONOMICS. Principles and analytical techniques in assessing the overall value of pharmaceutical products, services, programs and other health care interventions, including hands-on experience of pharmacoeconomic modeling. 795. SPECIAL TOPICS IN PHARMACY ADMINISTRATION. Course designed to cover special topics in pharmacy administration or health care administration in general that are not covered in regular courses and may be suitable for MS or PhD students in pharmacy administration or other related disciplines. Examples of recent special topics include: Categorical Data Analysis and Markov Simulation Modeling of Health-Related Events. Note this is only a list of graduate courses offered by the Department of Pharmacy Administration. 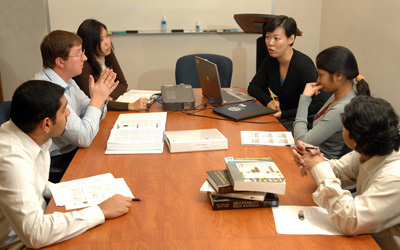 Graduate Students have the opportunity to take courses across campus including courses in the School of Business and in the School of Applied Sciences.